Ober Gruppe (also known as Karolinen, Carolina, Karolina, and Obergruppe; now known as Górna Grupa; population in 1905, 66; in 2013, 580; coordinates: 53.484777, 18.667058 [53° 29′ 5″ N, 18° 40′ 1″ E]) is located approximately 5 kilometres (3 miles) south-west of Dragacz (Dragass), 18 km. (11 miles) north-east of Świecie (Schwetz), and 51 km. (32 miles) north of Toruń (Thorn). Gruppe was a large gentry estate, owned by the Kopicki family in the 16th century and the Konarski family in the 17th and 18th centuries. 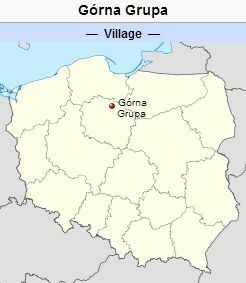 At some point it was transformed into three separate villages: Ober Gruppe (Górna Grupa), Nieder Gruppe (Dolna Grupa), and Gruppe (Grupa), always linked however by one owner. Until 1772 Ober Gruppe was located in what was known as Royal Prussia (also known as Polish Prussia) in the Kingdom of Poland. The First Partition of Poland in 1772 resulted in the creation of a new province on 31 January 1773, called West Prussia, in which Ober Gruppe was located. Ober Gruppe was situated in the district (Kreis) of Schwetz in Regierungsbezirk Marienwerder until the end of World War I, when it came under the jurisdiction of the Pomeranian Voivodeship of the Second Polish Republic. Ober Gruppe came under the control of Nazi Germany during World War II until March 1945, when it was occupied by Soviet forces and returned to Poland. In 2013 Górna Grupa was a village in the administrative district of Gmina Dragacz, within Świecie County, Kuyavian-Pomeranian Voivodeship. In 1935 there were 12 Mennonite families in Ober Gruppe with the following surnames: Balzer, Becher, Ewert (five families), Franz, Kerber, Kliewer, and Tyart. Mennonite who were residents of Ober Gruppe were members of the Montau-Gruppe Mennonite Church. Stowarzyszenie Konserwatorów Zabytków. "Górna Grupa." Catalogue of Monuments of Dutch Colonization in Poland. 2005. Web. 14 March 2013. http://holland.org.pl/art.php?kat=obiekt&id=490&lang=en. Wikipedia. "Górna Grupa." Web. 14 March 2013. http://en.wikipedia.org/wiki/Górna_Grupa. Wolf, Hans-Jürgen. "Familienforschung in Westpreußen." Web. 14 March 2013. http://www.westpreussen.de/cms/ct/ortsverzeichnis/details.php?ID=2938. Thiessen, Richard D. "Ober Gruppe (Kuyavian-Pomeranian Voivodeship, Poland)." Global Anabaptist Mennonite Encyclopedia Online. March 2013. Web. 25 Apr 2019. http://gameo.org/index.php?title=Ober_Gruppe_(Kuyavian-Pomeranian_Voivodeship,_Poland)&oldid=123958. Thiessen, Richard D. (March 2013). Ober Gruppe (Kuyavian-Pomeranian Voivodeship, Poland). Global Anabaptist Mennonite Encyclopedia Online. Retrieved 25 April 2019, from http://gameo.org/index.php?title=Ober_Gruppe_(Kuyavian-Pomeranian_Voivodeship,_Poland)&oldid=123958. This page was last modified on 10 August 2014, at 18:13.